One year ago today, I dropped off my oldest son at kindergarten, walking him to his classroom and entrusting him to the care of his teachers. That afternoon I spoke at the funeral of a ten-year-old boy, the oldest son of someone else who had once done that very same thing as a parent. His family had asked me to do that as a person of faith, even though the service itself was non-religious. What we had in common was an understanding that our children are gifts and that we have to let them go. It’s not fair when that happens through an untimely death. Some people will say that I should have talked more about my faith and the God that I believe entered into the muddy waters of our humanity in Jesus. Others will think the opposite, saying that I stepped out in faith too far. If I crossed a sacred boundary, it was because I was invited to do so by parents who not only cared about their first-born child but cared about others who loved him too. Love, therefore, became the thread that made a connection between all of us. It brought to mind the opening words of a beautiful antiphon that I didn’t quote in my remarks but have contemplated a lot: “Ubi caritas et amor, Deus ibi est,” which means, “Where charity and love are, God is there.” This I believe. Those words come from an ancient letter in the New Testament. They conclude an ode to love within that letter, one that Christians have treasured throughout the centuries, not only in times of joy but also in times of sorrow. My name is Neil Willard. I’m an Episcopal priest and serve as the Rector of St. Stephen’s Episcopal Church in Edina. Henry’s parents, Jenn and Troy, have asked me to say a few words as a person of faith, knowing that not everyone in this room shares that with me. We’re here with Jenn and Troy and their youngest son Eli this afternoon because of a terrible disease that took their oldest son and brother away from them far too soon. Eli has thankfully been able to receive treatment for that same disease. So he brings hope to hearts that are otherwise broken with sadness today. The great sense of loss that we are feeling right now is equal to the great sense of love that we have known in Henry’s presence. It is a hard thing to realize that “love in our world is suffering love” and always has been. It’s true that some people never seem to suffer very much. But those people never seem to love very much either. “Suffering is for the loving,” as we know all too well today. 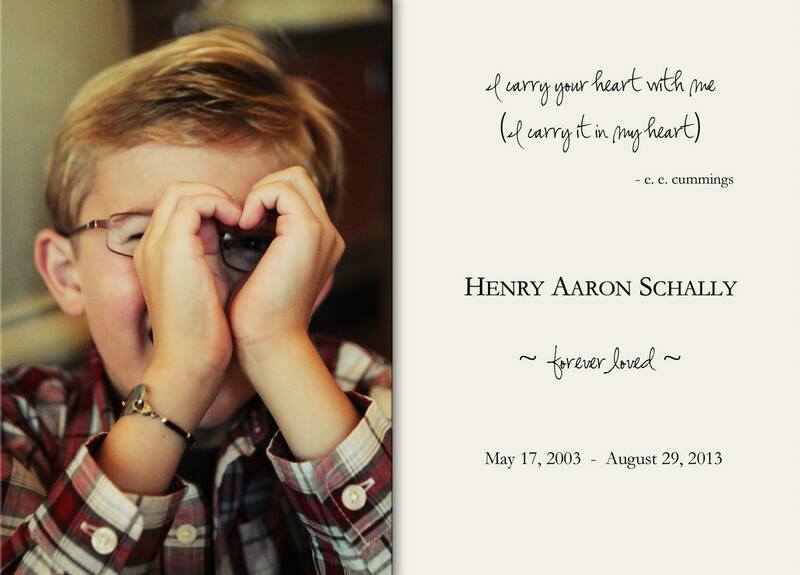 Henry’s death isn’t something we’ll ever be able to fully comprehend. We can’t sort this out in our minds because it isn’t the way things are supposed to be. When our elders die, much of the past is lost in the shadow of death – memories of earlier generations that are buried with them. But when children die, they take both their future and our future with them to the grave. The world is turned upside down, and the ground on which we had been standing so firmly heaves and quakes beneath us, leaving behind only chaos. But please: Don’t say it’s not really so bad. Because it is. Death is awful, demonic. If you think your task as a comforter is to tell me that, really, all things considered, it’s not so bad, you do not sit with me in my grief but place yourself off in the distance away from me. Over there, you are of no help. What I need to hear from you is that you recognize how painful it is. I need to hear from you that you are with me in my desperation. To comfort me, you have to come close. Come sit beside me on my mourning bench. Jenn, Troy, and Eli, the people in this room are sitting beside you on that mourning bench. Your grief will not soon go away, so you will have to stay there for more than an afternoon. You don’t have a choice about that, but the rest of us do. It’s a hard choice to stay there a week from now, a month from now. There are friends in this room, however, who will make that hard choice and sit beside you through the night of your sorrow. Perhaps you and those friends will talk about this wonderful photo of Henry in which he’s making a heart with his hands and peeking through it. It’s the perfect reminder of the love that he shared with the world around him. That love extended far beyond the state of Minnesota. It had a radius of at least 275 miles. I know this because a sign in Henry’s room tells everyone who visits there that he or she is standing exactly 275 miles from Lambeau Field in Green Bay, Wisconsin. Henry was not ashamed of his love for the Packers in general and his love for their quarterback, Aaron Rodgers, in particular. Much closer to home is another place that Henry “loved, loved, loved.” It’s his school, Emmet D. Williams Elementary, which is located a little more than a thousand feet down the street from that same bedroom. He loved the people there, not only his peers but also the teachers and other adults who are members of that academic community. The last artwork that Henry created at school has hearts stamped on it – a fitting theme for today, which, as most of you know, is the first day of school for Henry’s classmates. Closer still was Henry’s family – his mother, his father, and his little brother. There’s a beautiful symbol of that love in Henry’s bedroom. It’s a secret door beneath his desk that leads to a clubhouse, which is really a closet between his bedroom and his brother’s bedroom just a few feet away. It was created to be a place for both of them to escape into the playground of their imaginations. Henry was safe in that home because he was surrounded by love, and those who shared it with him were surrounded by his love. Merciful Creator, your Holy Spirit intercedes for us even when we do not know how to pray. Send your Spirit now to comfort us in these days of need and loss. You entrusted Henry to us to know and to love as a companion on our earthly pilgrimage. As we thank you for the life we shared, help us to release him to your mighty keeping. This I ask in the name of Jesus, who gathered the little ones into his arms and blessed them. May this child be welcomed for ever in that embrace. 1 BACK TO POST Nicolas Wolterstorff, Lament for a Son (Grand Rapids: Eerdmans, 1987) 89. This quote continues with language that I adapted for my next two sentences. This book is Wolterstorff’s reflection on the death of his son in a mountain-climbing accident at the age of twenty-five. 2 BACK TO POST Wolterstorff 89. 3 BACK TO POST Wolterstorff 16. 4 BACK TO POST Wolterstorff 34. 5 BACK TO POST Henry’s mother described his love for school with these words. 6 BACK TO POST Dante Alighieri, Paradiso, Canto XXXIII, 145. Thank you. We lost our vibrant, smart, funny, athletic 16 year old son this summer after a misdiagnosis that led to heart and liver failure. Your words brought comfort to me today… one of the hard days. I will search out “Lament for a Son” immediately.